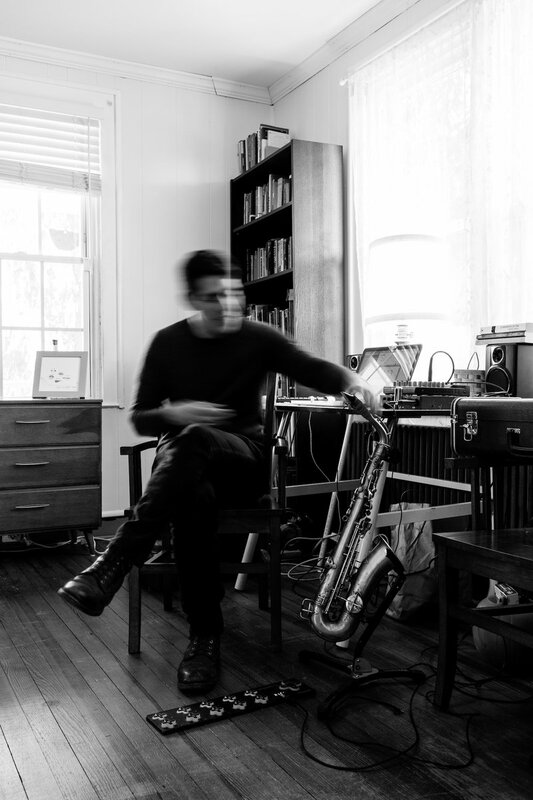 On September 28th, Horse Lords saxophonist/percussionist Andrew Bernstein dropped his monstrous fourth solo record, An Exploded View of Time. As the title suggests, Bernstein deliberately messes with the listener’s perception of time with the ebbing, flowing, wailing, and droning of one saxophone -- no overdubs (the sole exception being “Deus Ex Machina,” a centerpiece backed by an interactive drone). 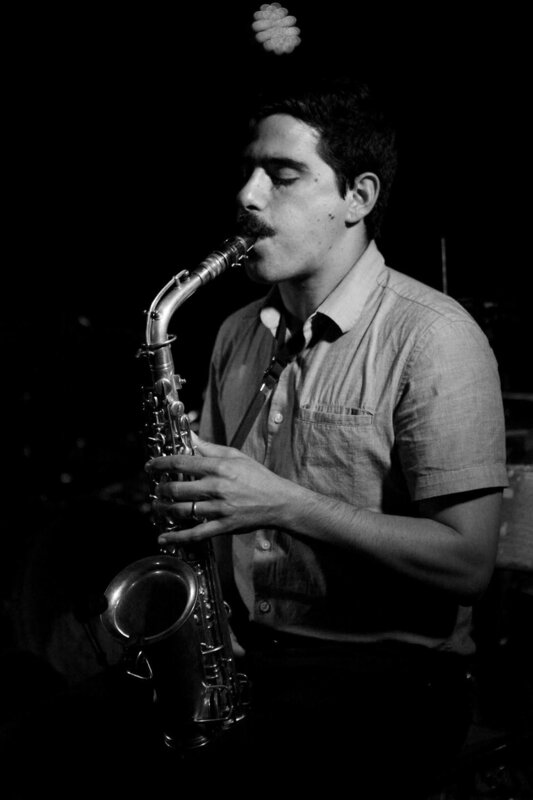 If you aren’t already hip to minimalist composition or experimental saxophone music, fear not. There’s a lot to be gleaned from An Exploded View of Time, which is, at its core, seven sick sax songs that work disgustingly well as one complete listen. As a listener, I found the most enjoyment to come from latching onto a specific note and timbre amidst the multiphonics (a term Bernstein patiently explained to me), kind of like maintaining a home base in the song. It is alarmingly easy to lose yourself in this record -- all you have to do is pay close attention to it. I talked to Bernstein about AEVoT, repeating oneself, and neighbors. The conversation has been edited for length and clarity. Do you hear lines or phrases in your head before picking up the saxophone? I sit with the saxophone, and then I improvise and play around with different ideas and develop them that way, more so than hearing an idea in my head specifically, then sitting down with the saxophone and make the sound. It's a recursive loop. I make sound with the saxophone and think about the sounds that I'm making and then I think about how I could refine that in some way and then continue to test things and see where they go. Do you typically work through a song in one sitting? No, it definitely happens over time. Maybe in one sitting I'll sit down and play for a while and some things stand out to me as work developing and maybe next time I'll come back to that and see where it goes. As a listener, what are the ideal conditions under which to enjoy An Exploded View of Time? Seated, with low light, in a quiet place. Does that mirror how you think about your own music? Yeah, kind of. I listen to music almost in a liminal state. Some of my deepest listening experiences are when I'm focused on the music, but then that focus explodes into a lot of different thoughts. When I’m inspired by music, I stop thinking about what I'm hearing in that moment, but it causes me to think all these other thoughts, and that's what I hope to inspire in other people. Would it be fair to say that the title An Exploded View of Time suggests that -- sorry for the phrase -- hypnosis is your endgame? I wouldn't say hypnosis is an end game, but it's a stop along the way, you know, a tactic. I guess that's the state that I was just talking about -- I feel like repetition can open up the mind to wander and open other doors. There's layers, references, sonic and otherwise, and that's what the title's referencing. Like a textbook diagram, when you break it up, there are fifty pieces that putting it together. Did you have an inclination for math as a kid? Not so much. I feel like as an adult, I'm much more interested in math and wish I had more of an inclination for it when I was a kid cause I could some of those skills now. I'm much more interested in mathematics and seeing the beauty in math now then I did when I was a teenager when I should have been studying more. I remember the division between kids who were interested in the humanities and kids who were interested in math, but it feels like the lines are way more blurred once you reach adulthood. Sure, totally. I feel like the way people talk about math -- even the idea that there are math people and then are people who are not math people -- everybody's got strengths and weaknesses and whatnot. I feel like it's not helpful to talk about people like that because the world is so complex and putting people into boxes into that isn't helpful. You're doing a run of live shows this year. Compared to playing in a band, what do you get out of performing solo? Playing with Horse Lords is incredibly satisfying. Playing solo -- I get a similar sense of feeling. When it's really clicking, you lose yourself, and you're just playing, and I feel like that's not specific to playing solo, but I also get that playing solo. It's definitely a little more nerve-wracking being onstage myself and not having anyone else to rely on. But it can be freeing, especially playing somewhat improvised music. Playing group improvisation is a lot more difficult than solo improvisation, in some ways. When you're in a conversation with someone else, you have to respond to things they play or say, their actions. That's just a hard thing to do sometimes, to respond elegantly. I think it's something that I love to do, also. I was just talking to somebody last night about improvisation, especially group improvisation. It's a great risk when you're playing with people; you don't know what's going to happen. It could not be very good, and that's the case a lot of the time. But there's this chance that something will happen that you had no idea could happen and you couldn't have planned for it. That's the magic of it, that's what makes it worthwhile. I found this record to be a mixture of the right-brain/left-brain mentality, like the difference between running a marathon and making music. When you were making the record, how did you see those two sides? I definitely think about that at times. I don't want this to fall into shredding. I've talked about this a bunch with friends: Juggling is very effective. No shade to jugglers -- I'm sure jugglers consider what they're doing art, and that's great -- but maybe a marathon is a better metaphor, where I can not offend anyone. I don't know if a marathon runner would consider what they're doing art, even if it is very impressive. I'm definitely trying to walk that line some. I enjoy pushing myself on my instrument, and that's part of the reason for the music that I make is that I like to hear it and I like to play it. It's a satisfying exercise for me to push myself technically. But if it just ended there, I don't think that'd be interesting art. I definitely try to be very conscious of trying not to run a marathon. Was it an explicit decision to smoothen out the mix, compared to past solo records? Definitely. I feel like it's always a work in progress, making records, and this is the happiest I've been with a recording of my saxophone. I feel like I've been trying to make this record for a few years. Those other records had other pieces, too, that weren't saxophone. But as far as my saxophone playing on those records, I feel like I was trying to get to this one, and this is the best representation of this kind of music that I've been trying to make for a few years. With the record tracked a year ago, have you had the gears turning for a next record and what you want to level up on? Sure, I've got some new music that I've been working on. This past year, I've had a couple opportunities to play a multi-channel surround sound conference with saxophone and electronics and working with spatializing the sax. I have a foot controller and I'm with some delays and spatialization, having things spin around the room, things like that, which has been a satisfying and challenging change. With this record, I wanted to pull back from a lot of electronic work that I do and simplify, in some ways. Just make, for the most part, a solo saxophone record. It's been satisfying to dig back into the challenges I've been working on with electronics. That must be cool, then, getting the chance to put in all the prep work if you're used to improvisation. Yeah, totally. I don't like to repeat myself so much. I love playing saxophone, I'm going to continue to do it, and I'm very happy to be considered a saxophonist, but -- like I was saying before, putting people into boxes -- but that's not all of who I am or what I do, so I'm doing other things, too.